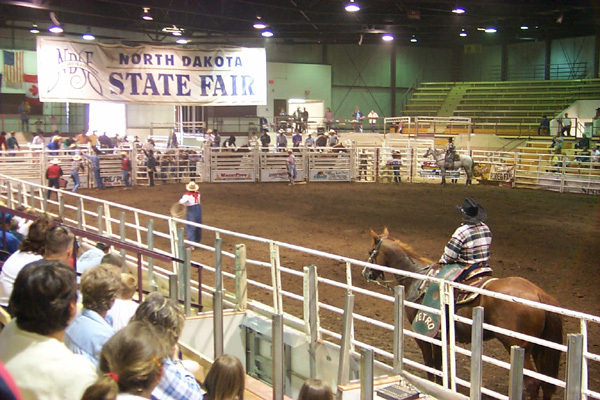 Win Tickets to the Ranch Rodeo at the NDSF - Word on the street with Visit Minot!Word on the street with Visit Minot! This is not your typical rodeo! In this 7th annual competition teams of cowboys and cowgirls will compete against each other in events that display somewhat typical ranch jobs, such as trailer loading,team mugging and even wild cow milking! We’ve got two tickets to the Ranch Rodeo on Thursday, July 24th (show starts at 7pm). For a chance to win a pair of tickets, leave a comment below letting us know who you’d like to take to the Ranch Rodeo! A winner will be selected and notified (via email) on Monday, July 21st. UPDATE: Congrats to our blog winner, Danielle S.
i love take my dad it his 64th birthday next week. I would love to take my kids, we haven’t made it to any area rodeos yet this summer and this would be a great one to bring the kids to. I would like to take my husband! We were just restationed from nellis AFB, Nevada to Minot AFB, ND due to my father in law being terminally ill. It has been a stressful move, and this would be a great treat for both of us!! I would love to take my husband as an early 40th birthday gift!! I would love to take my daughter to the rodeo, she wants her 10th Birthday(on July 24th) at the State Fair. So this would be a great perfect birthday surprise and gift for my babygirl. I would love to see the rodeo again, great date night! I would love to take my boyfriend while he is back in town. I’d take my son Remimgton! I’d take my son, Remington. I would take my lovely girlfriend! I don’t believe she has ever seen a live rodeo! My boyfriend & I would love to go! Would like to win these tickets for my husband and his dad to go together. I would take my god daughter,she loves ranch rodeos. I would love to take my daughter. She loves her horses and wants to ranch rodeo someday herself. I would love to take my 3 and 5 year old little boys They love rodeo! I think that all my kids would get a real kick out of this. They see their dad do it all the time…but not with horses etc. They’ve also heard alot of stories about milking cows by hand, but have never really experienced it. This would be great FUN! My husband would be there my date to watch our son’s ranch rodeo team compete. I would like to take my 4 boys. It’s a rodeo at our house everyday! I would love to take both of my daughter’s. I would take my 4 yr old “niece” as she loved the rodeo last yr! Nothing would bring me more joy than to take my beautiful fiancée Brittany! Would love to take the kids!!! I would like to take my 10 year old son. He is visiting from Montana for the summer. Would love to spend time with him at the rodeo. My 6 year old son would love to go as he always talks about becoming a bull rider!! I would take my 5 year old son!!! He would be so excited to go to the rodeo!!!! I would love to have a night out with my husband! I would take my child to the rodeo.